How to paint sunrise over mountain landscape. Learn to paint mountain range and sunrise from video tutorial and step by step images with instruction. In this tutorial, you will learn how to paint mountain top in a bright sun setting. It’s been a while since I’ve done any landscape or environmental painting and such. Feel kinda rusty, but I will post it anyway. This one is still a work in process which means I will work on it a little more or a lot more depending on what kind of idea I can come up with. In the beginning of the tutorial, I just paint mountain, cloud, and bright sky. 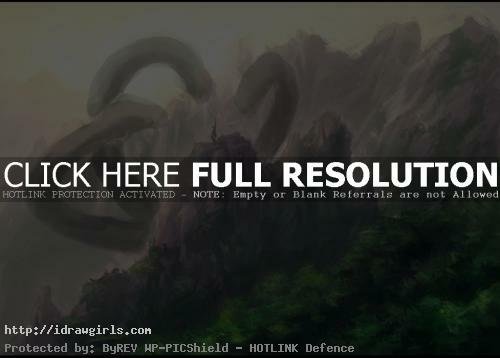 But later on in the process, I decided to add a hydra monster and a guy over the top of the foreground mountains. The painting process in this one is very similar to my other painting tutorial, I usually start off with monochromatic then introduce base color and additional color if needed. When you are watching the tutorial, it might seem easy to you. But as most of you mention that when you really doing it yourself, often it does not turn out as you expected. Three principle of painting tips that I can give you are correct drawing, correct value range, and properly place edges. Don’t worry so much about color yet. It will come, and once you understand these three things I mentioned. You can further explore color theory as you wish. 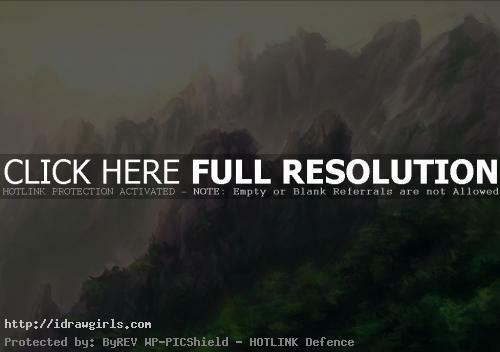 Here is a final image of sunrise over mountains landscape. Watch video tutorial how to paint sunrise over mountains landscape. Below are step by step images tutorial to complement the video lesson above. Step one, I start painting just basic shapes in foreground using darker value and backdrop using lighter value. Step two, then I paint some shadow onto the shapes to make them look more rock like. Step three, I then introduce base color into the scene. 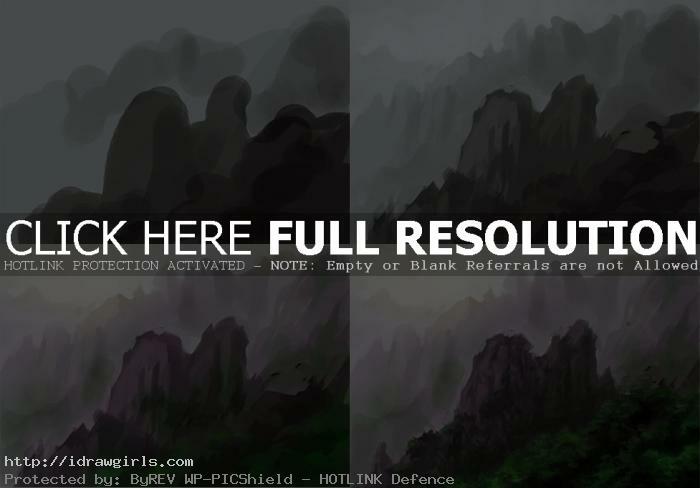 Step four, I refine mountain range using texture brushes and add some vegetation in the foreground. Watch the video tutorial above for more in depth detail instruction. Add creature into the scene, three headed Hydra. Still more work to be done. Will update again on another post soon. when you are doing the values in the beginning are you using a low opacity?